“Bird I wish existed” sketch by Gloria Poole of Missouri and Georgia on 22 June 2014; acrylic on 8 x 11 inkjet paper and displayed on my portable drawing board. Copyright Notice: this blog and all content on it belongs exclusively to me Gloria Poole residing in Missouri but born in the state of Georgia. It may not be transferred to anyone anywhere, nor have domains transferred to it that do not belong to me; nor be re-published, nor saved to disk, nor printed at remote; nor copied, nor photo-copied. 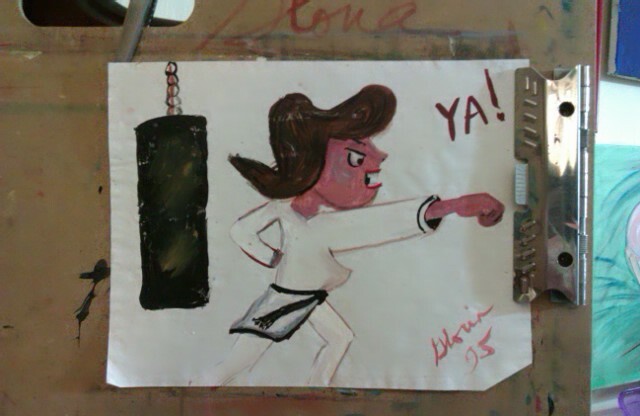 I, Gloria, Poole, drew this, painted it, signed it, photographed it, and uploaded it to this blog of mine as always. As such it is intellectual property and is covered by U S copyright law. Yesterday, I also put eleven more birds that I drew painted signed with different mediums & on different surfaces on another blog of mine at : https://mini-exhibition.blogspot.com. I think birds are beautiful creatures because of how they look and because they sing! In fact, they are singing outside my window right this minute. Gloria Poole / Gloria / gloria.poole / gloriapoole1749 / gloria-poole / @gloriapoole / G-L-O-R-I-A / artist-gloriapoole / gloriapoole-paintings / Gloria Poole, RN, artist / Ms Gloria Poole / Poole.Gloria / , at my own private, not-shared apt in Missouri, 22 June 2014 at 7:15am. This cartoon is one I, Gloria Poole, drew, painted, signed, in about year 1995 when I lived in Atlanta, Ga; and I photographed it and uploaded it to make a point. I, Gloria Poole, born in the state of Georgia, and residing in Missouri, own all rights to this blog and it’s content exclusively. This is not a shared blog and never was. Copyright Notice: this blog and all content is copyrighted under U S copyright law as intellectual property containing original art created and signed by me, photographed by me and uploaded from my own equipment by me Gloria Poole of Missouri . I, Gloria Poole, have this cartoon and all the art that I posted to this blog. This blog and its content may not be transferred to anyone anywhere, nor have domains forwarded to it that do not belong to me, nor be copied, nor photo-copied, nor printed at remote, nor saved to disk by anyone. This blog is not a shared blog and never was. I, Gloria Poole, am a single again, white, Christian, woman and the mother of two daughters who are Jennifer and Leigh. 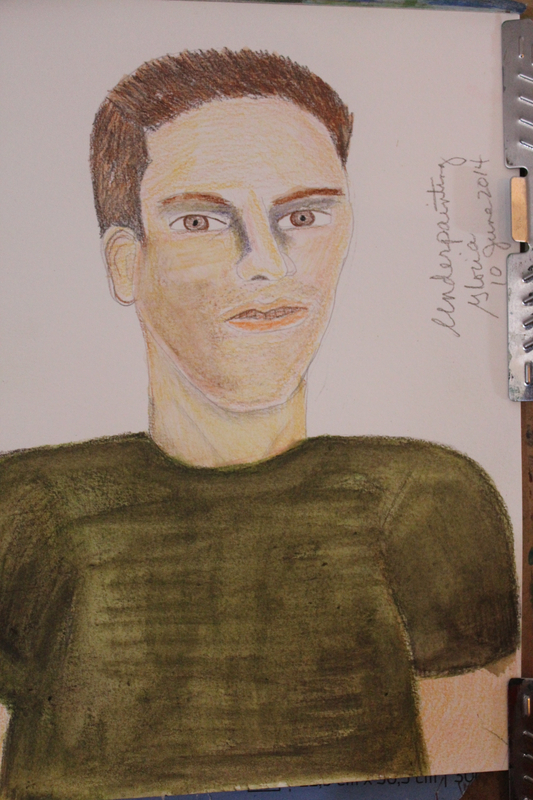 Also, fyi, the U S veteran in the previous post is NOT a real person but one I created on paper with a pencil and paint. Gloria Poole / Gloria / gloriapoole1749 / gloriapoole / artist-gloriapoole / Gloria Poole,RN, artist / gloriapoole-paintings / Gloria Poole / gloria-poole /gloria.poole / ,at my own private apt in Missouri, 14 June 2014 at 7:39pm. Underpainting of sketch of US veteran who is back in States, by Gloria Poole of Missouri and Georgia. This is a sketch I, Gloria Poole, RN, artist of Missouri, drew, painted, signed, photographed and uploaded today to this blog of mine, which is one of the blogs I display art I create on, often. This is a “pretend person” and is supposed to be a U S veteran who is back in the States after a deployment abroad. This blog and all content on it, all words, all photos, all art belongs to me Gloria Poole of Missouri. I am a white, single again woman [divorced twice] and the mother of two grown daughters who are Jennifer and Leigh. I am also Christian, republican, prolife and an artist in all mediums and a Registered Nurse licensed in Missouri. I have three brothers [and two sisters] and two of my brothers were in the U S military so it is a familiar theme to me. Also, my father and grandfather [on my mother’s side family] were. I photograph some on Memorial Day to honor the U S vets and I have written poems twice to honor them. Copyright notice: This blog and all content on it is copyrighted, and I, Gloria Poole, of Missouri and Georgia, own all rights to it. This blog and or its individual posts may not be transferred to anyone anywhere, nor have domains that do not belong to me forwarded to it, nor be republished, nor printed at remote, nor copied, nor photocopied, nor saved to disk by anyone [other than me Gloria Poole as creator/owner .] I have this sketch and it is a work in progress, meaning it is not in its final / finished / complete stage. An underpainting is intended to help define faces, and determine depth of pigments, and shadows , and highlights etc. I will most likely repaint this in acrylics when I sit down to my drawing table in a right frame of mind to correct flaws in it. It is fastened to my portable drawing board. Gloria Poole / Gloria / gloriapoole1749 / gloria-poole / gloria.poole / artist-gloriapoole/ Gloria Poole, RN, artist / gloria0817 / gpoole817 / and other variations of my real, born with, legal name of Gloria Poole since I resumed my maiden name after both divorces; at my own private apt in Missouri; 10 June 2014 at 6:07pm. Walkway to lake sketch by Gloria Poole of Missouri and Georgia is watercolors on paper sized 9 x12 inches. It’s a simple quick underpainting of a landscape and I will probably do-over the painting of it with acrylics. I do very quick sketches in watercolors often because they are quick, uncomplicated and easy to paint over with either oils or acrylics. Also, see the about me page of one of my blogs at https://gloriapoole.blogspot.com for the full copyright notice and disclosure of information that could affect copyright enquiries. Copyright Notice: I, Gloria Poole, currently residing in Missouri but born in the state of Georgia, own all rights to this blog and to all content of it. This blog and its content may not be transferred, nor printed at remote, nor copied, nor photocopied, nor downloaded by anyone [other than me since I created it]; nor have domains forwarded to it that I do not own; nor saved to disk. For the record, I am a white, single again, Southern Baptist Christian, woman and the mother of two grown daughters who are Jennifer and Leigh. I am also a Registered Nurse licensed in Missouri and a photographer, and artist in all mediums. You can easily see that this sketch is on my portable drawing board [and is a bit lop-sided] . I had smeared paint all over my thumb unintentionally when I was trying to clip it to the board, and was anxious I had gotten paint on my camera! But I stand lop-sided because of fractures I had secondary to trauma and violence against me and surgical repair of those fractures with much metal. So I have to consciously think how to correct for that lop-sidedness when I am photographing. Sometimes, I forget to do that. The paper is not lop-sided since it is commercial sketch paper bought in a block-tablet. My fastening it to the portable drawing board while standing is what makes it appear lop-sided. I will correct photo when I do-over the sketch. Gloria Poole is my real, born with, legal name since I resumed my maiden name after both divorces. Gloria Poole / Gloria / gloriapoole / gloria-poole / gloria.poole / artist-gloriapoole / Ms Gloria Poole / Gloria Poole, RN, artist, copyright; at my own private apt in Missouri, 8 June 2014 at 8:55 am.